Create a prosthetic for any biological creature that gives it an extra ability, replaces a function that has been removed, or will enhance the creature in some way. 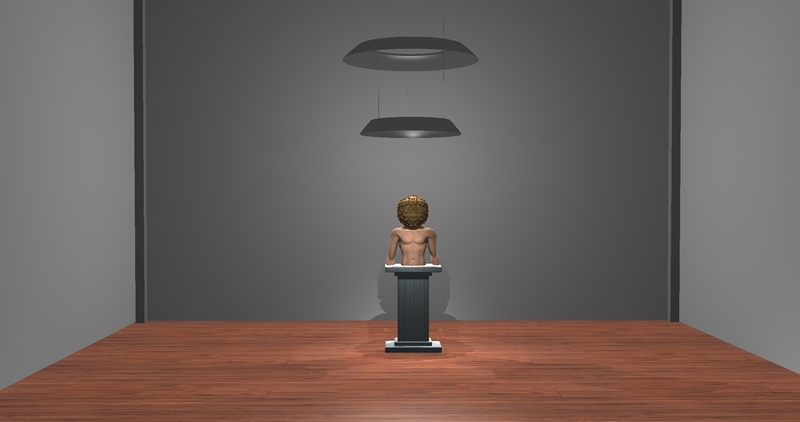 Then 3D model it and fabricate it. After coming up with a list of five+ ideas, I decided to focus on the idea of sensory deprivation. I was interested in the concept of subtracting sensory inputs to the body rather than adding even more. By diminishing the senses of the body, in a way, you can enhance other parts of the body; for this application, it would be the brain. By depriving the body of sight, taste, smell, and hearing, you in turn are able to focus more on your inner self. From research, I knew that sensory deprivation chambers were built for this exact purpose. With that in mind, I designed a portable version of a sensory deprivation chamber. 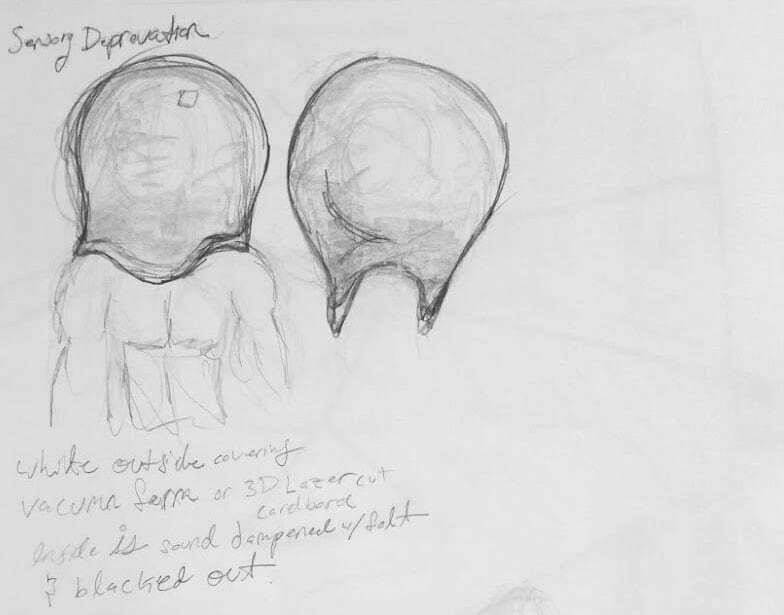 As I did some preliminary sketching, I originally envisioned a large spherical white plastic helmet type of device filled with sound dampening material and blacked out entirely on the inside. I had planned on vacuum forming the outer plastic shell. Then for the interior, it would be filled with padding, foam, sound dampening material and black fabric. Unfortunately, we do have a vacuum former, but it doesn't run. As a result, I had to change my design choices for the helmet. 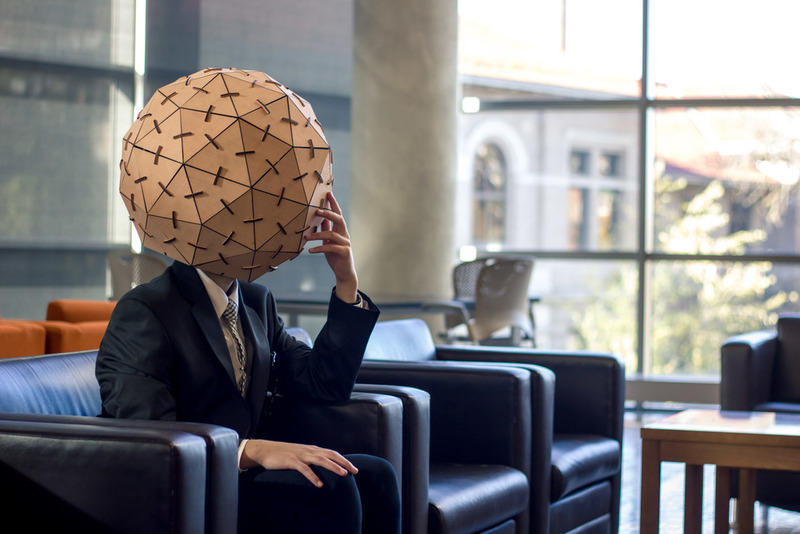 In planning the sensory deprivation helmet, I was determined to make it a spherical dome that would be worn as a helmet. My problem, was just figuring out how to do that. In response I turned to geodesic domes. I knew of their potential and the ideology behind them. Based on their simple structure, I figured that I could use a laser cutter to produce one. 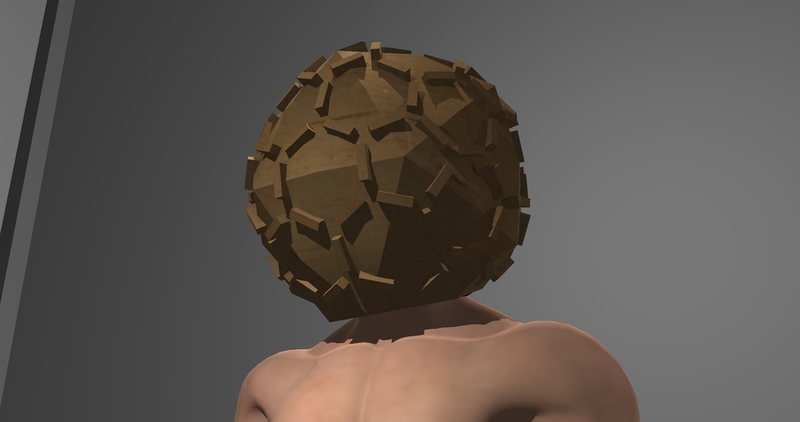 By creating two domes, I could create a large sphere and then leave a hole in the bottom for the head. 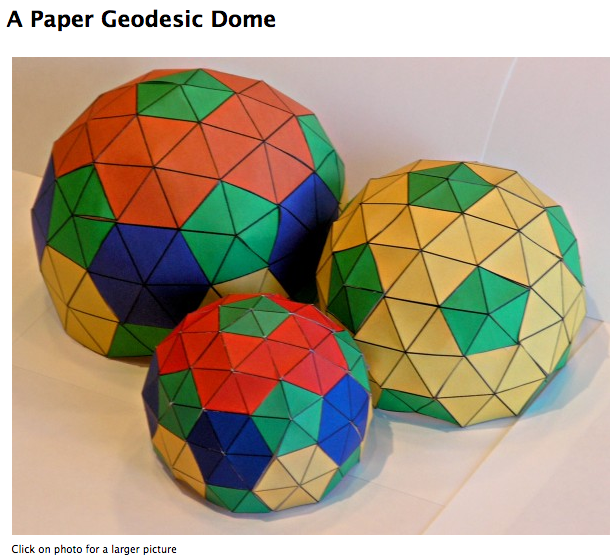 A geodesic dome is essentially a combination of equilateral and isosceles triangles arranged to create pentagons and hexagons that then are placed in a repeating pattern to form a dome. So it was quite simple to construct after some measurements and calculations where made. With that in mind, I found a couple formulas that allowed me to plug in measurements like the radius of the dome, and it would figure out the A, B and C lengths of both triangles. After the measurements of the A, B, and C sides were done, it was time to figure out how the triangles would fit together. 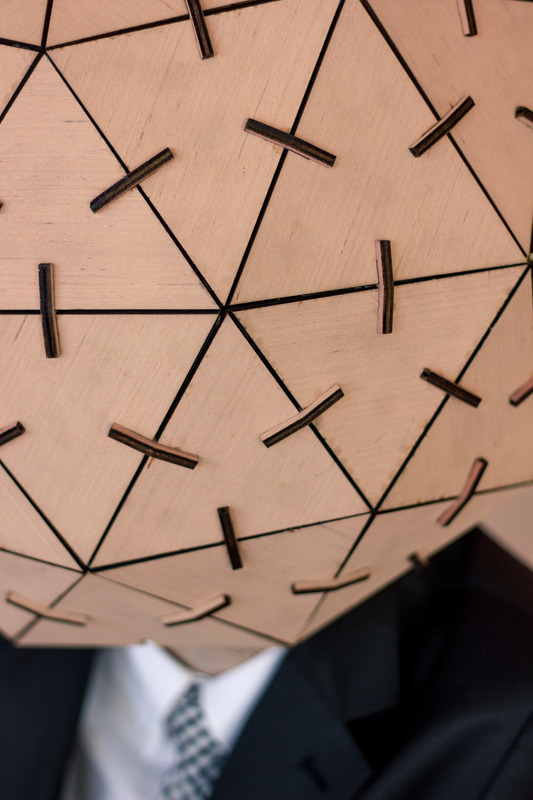 In researching laser cut geodesic domes, I came across a particular method that combined the triangles in a unique way. At the midpoint of every triangle, there is a small notch. Then a 3rd piece of laser cut wood intersects the two of the triangle's notches and it hold them together (kinda confusing to explain. Just look at the final pictures it makes more sense). By creating a 14 degree angle arc between both sides, it allows for the perfect completion of a dome. For me, this was crucial information to make this come to fruition. Ignore the A, B and C measurements.. this was just an example photograph. 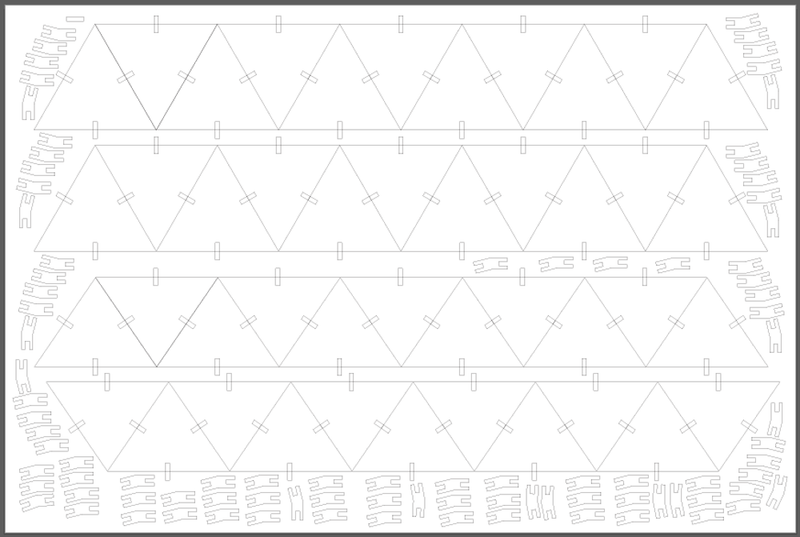 Finally, after the measurements were accounted for, I created a laser cut guideline in Illustrator for the cuts. 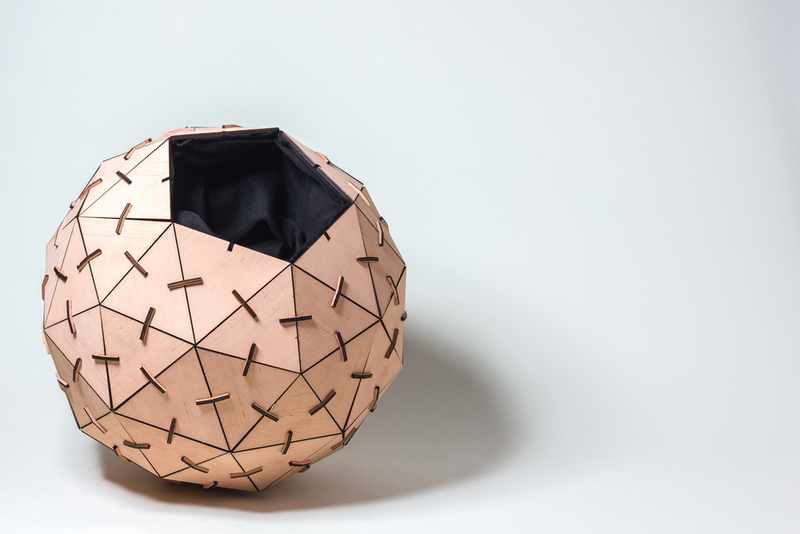 These plans specifically are only good for creating two 18in diameter domes that are cut from 3mm thick plywood. The notches that are created are dependent on the thickness of the wood. Thicker wood, thicker notches and vice versa. The assembly of this helmet was pretty straight forward. 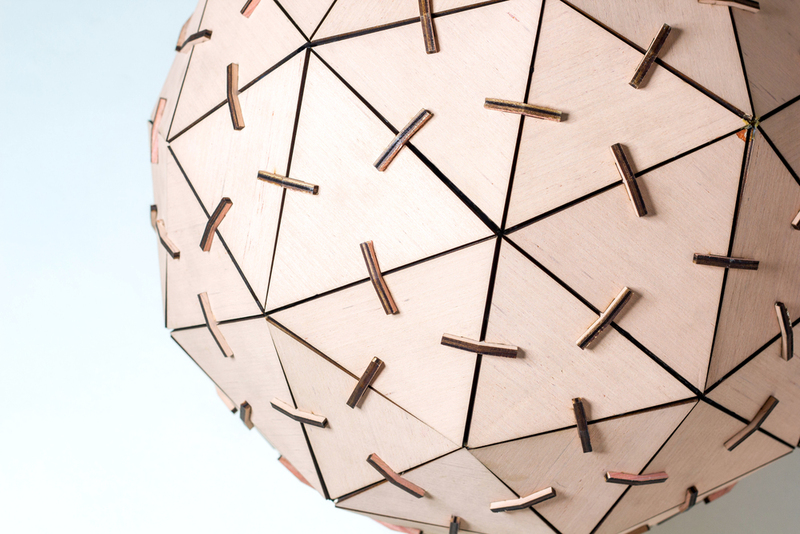 By follow the geodesic plans and putting the triangles together accordingly, it comes together quite easily. Some sections are harder than others to match up, but it all worked out in the end. I may have broken a couple of the connecting joints, but besides that, there wasn't much trouble. 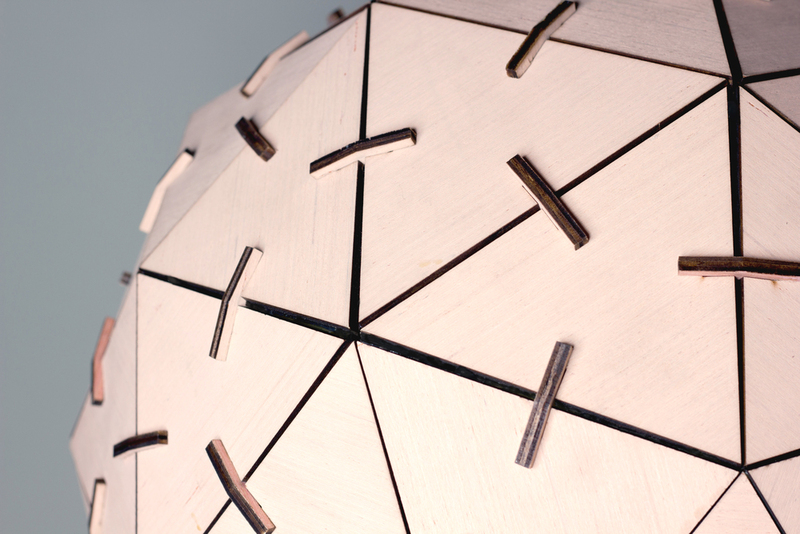 One thing to note is that these triangles are to hold together without any glue or adhesive. Just the friction between the joints allows this to stay together. However I needed this to be as sturdy as a rock, because this would be handled by a lot of people in a gallery. 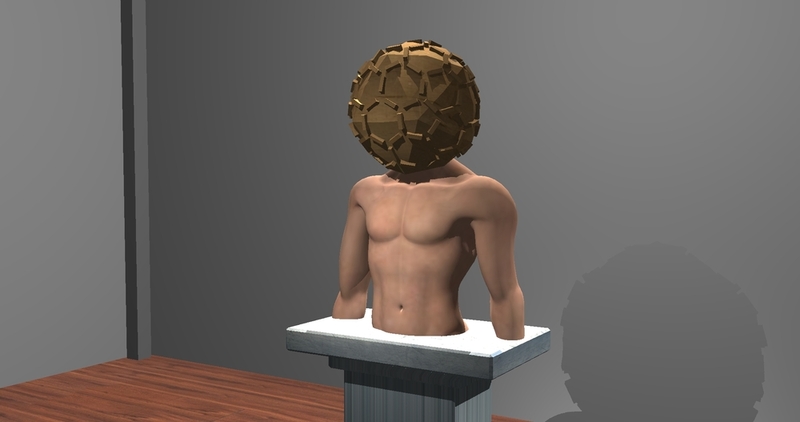 So I assembled it once to make sure it fit together correctly, then disassembled the helmet until it was just a dome. From there, I took woodglue and glued all the joints together to ensure a structural support. 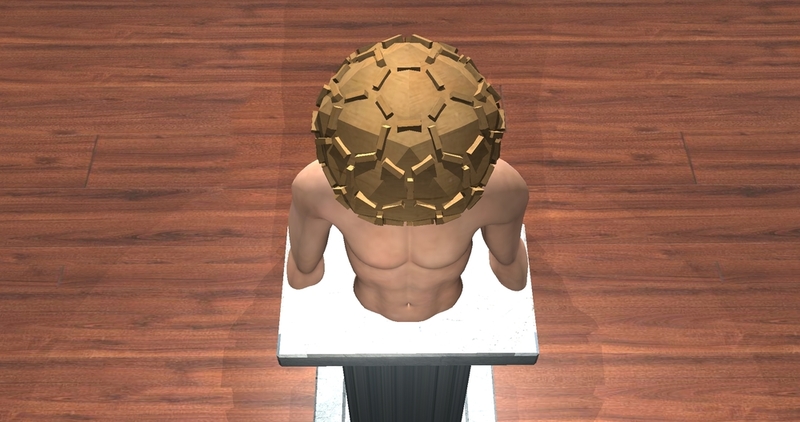 Regarding the inside of the helmet, it is actually cardboard that is folded and bent in such a way to create a cage inside the helmet to allow the head to rest on. On top of the cardboard are miniature pillows that are glued around the inside of the helmet. Then finally there is a large double layered felt sheet that was sewn in to create a liner for the helmet. With that, it provides comfort, sound dampening, and blacks out the inside of the helmet.